We’ve all seen cool resin pendants at jewellery shops, boutiques, and on fashionable people everywhere. They’re an excellent way to accessorize, and you can memorialize your meaningful objects and ephemera into something you can wear every day. While creating resin jewellery yourself initially seems like an intimidating project, this is something that anyone can do at home. Here are a few tips. For resin jewellery, you can usually choose to use polyurethane casting resin, or polyester casting resin. Be sure to choose the best casting resin for the scale of your projects, as you can have dangerous results otherwise. For example, when creating a few pieces of resin jewellery in a small place, you wouldn’t want to use polyester casting, as it is better suited to large pieces and the toxicity isn’t good for wearable products unless it’s in very small amounts. This means you would most likely use it if you were creating a lot of pieces with very small resin pieces. Always remember to cover your work surface with waxed paper. If you happen to spill resin it can result in a big mess, effectively ruining your furniture. You’ll be protecting your body with latex gloves on your hands, and safety goggles on your eyes, why not also ensure that the furniture you’ve invested in doesn’t get ruined. Take note of the weather around you. Are you in a humid climate? If so, try to use a dehumidifier or an air conditioner while you’re working. Even if the weather is comfortable for you, it may be detrimental to your resin jewellery. If the humidity is bad enough, it will keep your project tacky, and it won’t fully harden. 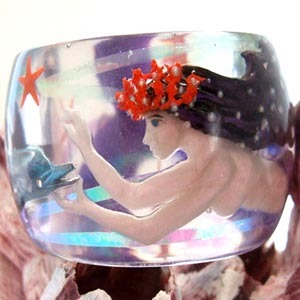 When jewellery in resin, you should be exacting in the variables of the item before you begin. For example, if you are including images printed on paper or transparencies, cut them out to your desired shape and then test them. Hold them up against the chain you’d like to hang the necklace on and envision the size and width. Ask yourself, “Does this work?” If you want your images to fully cover the bottom of a bezel, be very careful to cut them out at exactly the right size. Remember, some materials you’ll be able to redo the process if you’re dissatisfied with the results, others you won’t. People often try to get the air bubbles out of their resin jewellery with a heat tool, which is a great idea. A poor idea is using a hair dryer for that task, as hair dryers blow excessive amounts of air that can ruin your entire project, wasting your time and money. Whatever techniques you decide to use for creating your own resin jewellery, make sure you purchase the right casting materials for your project. For both amateur and advanced users, it’s important to purchase from suppliers that offer extensive information and guidance on using the chemicals. Dalchem is a specialist Melbourne supplier of materials that are used by hobbyists and household businesses alike. Our prices are competitive and reasonable, and we strive to provide you with the service and quality you require.